Exactly. 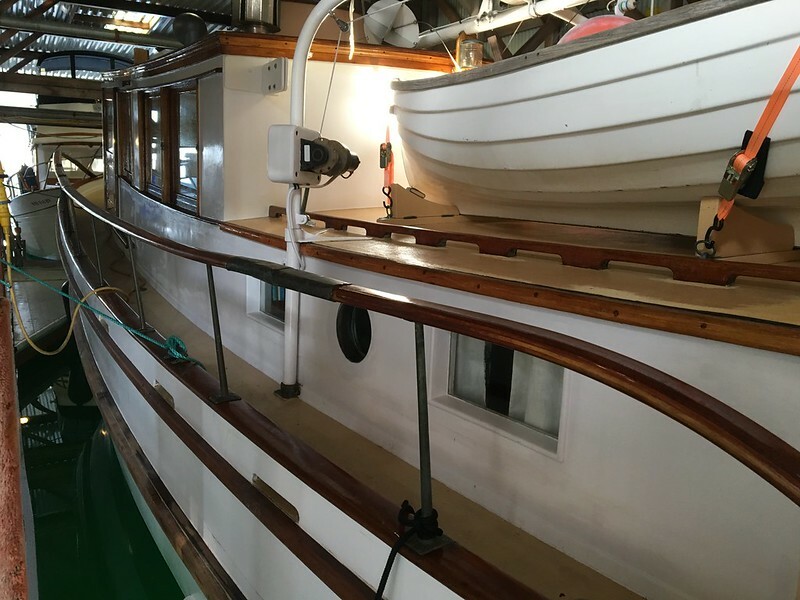 Whereas on Skookum Maru we would be sitting at anchor with all the drop windows in the salon open and a nice breeze blowing through, taking off the heat of the afternoon. Sipping a glass of dry cider while a couple of salmon steaks are grilling in the cockpit, next to some fresh asparagus. All it needs is a quick hollandaise sauce, easily made on the butane burner, and then top it off with a bit of dill.... And maybe a few fingerling potatoes for a starch. Toss them in salt, rosemary and olive oil and roast them in foil on the grill as well. Hm. Suddenly I'm ready for dinner. Ah - but do you get lobsters delivered to your boat? Have oysters a 3 minute dinghy ride away? I'm not gonna try to compete! I've been in the San Juans & know how beautiful they are - though Maine's islands are very similar. My boat was born in Seattle & grew up sailing in your area - so why would I not love it? Additionally, if I ever switch to power, I'll be hard pressed to buy anything other than a Monk. Oh - one thing I will mention: We stopped in York Maine on one trip, anchored in a place with 3' rollers (only spot available with Neoga's draft), & I dinghied in for fuel. When I got back there was a perfect quiche waiting to be eaten. Yes, there were some splotches on the cabin sides & inside cabin top. Didn't mind cleaning it up a bit! You're right about the lobsters though. My grandmother was a church organist and music teacher in Damariscotta. I remember visiting my grandparents one year and going with her to one of her lessons. When she was done her student, a high-school age kid, took me out in his skiff to pull traps and then he paid my grandmother in lobster. That's one of my favorite Maine memories, along with eating huge onion rings at a little roadside place on Rt. 1, visiting the Pemaquid Point lighthouse, and riding to Bangor in my grandfather's Maserati 200si racing car - back when you could still drive something like that on public roads. I have lots of good memories from Maine even though I've never lived there. So Maine's cold, humid, foggy, full of repellent adicted mosquitoes, inhabited by agressive lobstermen and threatening forumites, mmm... How could I have such fun cruising there in 2015? Am I turning masochist ? Probably, because I'd just love to sail there again, aboard a boat like Skookum Maru. Congrats, you have a superb boat ! To cook without turning on your stove in summer, if you have a genset aboard, these cheap and tiny induction gizmos are the solution. I've been using them for years with complete satisfaction. Except the need of turning on the genset. I don't want propane/ butane aboard. Lobsterman are only aggressive if you're stealing from their pots, drunk at the bar or in some other way screwing up their day. Typical for any waterman, otherwise they're pretty good guys. I was threatening? My apologies if it came across that way. I can't think of a person here that I'd want to threaten - so if I did, it was unintentional. As far as lobstermen go - NavyDog has it right. My comment on them has nothing to do with aggressiveness. At our mooring, we'll often see lobstermen going about their business. The only time they will get close to a boat is 1) if a pot has gotten close or tangled in a mooring line or 2) if someone like us flags them down & asks if they can buy some lobbies. In the latter case, cash changes hands & everyone is smiling. Hey did'nt you see the smiley ? I was joking. I love Maine and the people living there ! I only met friendly lobstermen, they are hardworkers and I respect them. Sailng in Maine was a highlight in my sailor life. Last edited by Rapelapente; 03-29-2019 at 07:23 AM. Sorry - I missed that. Sorry Garret - I didn't mean to start a "battle of the coasts" thread! In truth I love the Maine coast as well. I was actually born in in Amesbury, Massachusetts, home of the famous Lowell's Boat Shop, so I think I am not entirely without a little New-England-coast-cred. But circumstances (well, the Navy) took my parents to the West Coast when I was less than a year old so I grew up out here. So it goes. It would drop into the counter top right next to the Dickinson. It burns diesel so no other fuel is needed. And the installation is very similar to the requirements for the Espar heater that we just removed so it would be easy to install. With a little work I think it could be done without making any permanent changes to the boat at all. 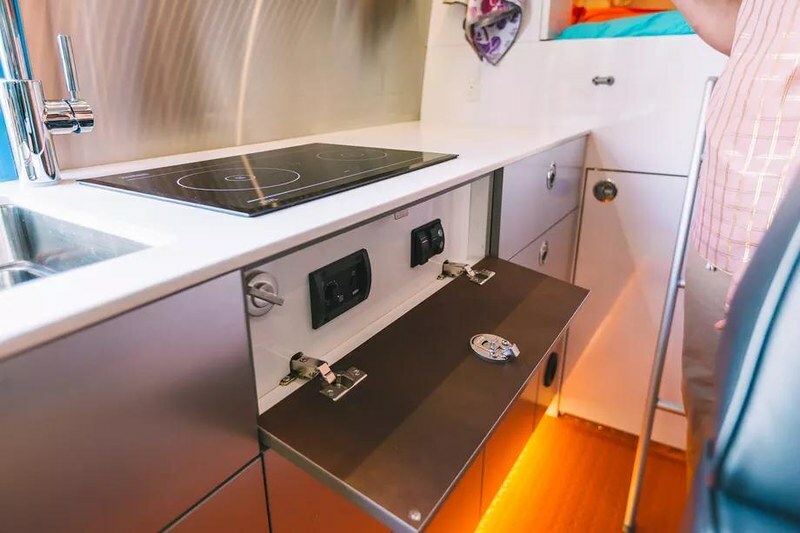 There are only two drawbacks that I see: It's very expensive in comparison to most of the other options, and the depth and ventilation requirements mean that we would lose the built-in cutting board and one drawer in the galley. In any case this is not a decision that we will need to make any time soon. We will use the butane burner and propane grill this summer and see how that works, and then come up with a plan for the long term. A # of years ago, I did a cell antenna audit for AT&T. A church in Amesbury had one in its steeple - so I had to climb up to inventory what it was. To get there meant climbing ladders up through the bell tower. As I came up through the trap door into the bell room itself, I almost hit my head on the 6 ft. diameter bell. When I looked at it a bit more closely, it had "Paul Revere & Sons" cast into it. That sent a shiver down my spine. Anyway - back to the boat! It popped up on craigslist yesterday and I've made arrangements to go get it this weekend. It's a "Portage Bay Skiff", a boat that was sold as a kit by the Wooden Boat Shop here in Seattle. I worked for them as a kid in the early 1980s and saw a bunch of these little boats around the shop back then. Nothing fancy - just a little plywood flat-bottom row boat. But at just 7' long I figure it's about the right size for Dash to grow into. You know that would look good as the mothership S.M. 's dinghy. Good looking and lighter, so S.M. 's davit winch would be happy. Yes to all of the above, except that I think this little boat would be hard-pressed to carry two adults, a child, a medium-sized dog and a load of groceries. Add in a little bit of a chop and I think it would be a fifty-fifty thing whether we made it ashore dry foot. Or dry anything. But replacing the electric winch with a manual one is on my list. I never had a problem with the manual winch on Savona and she had a dinghy similar to the one on Skookum Maru. It popped up on craigslist yesterday and I've made arrangements to go get it this weekend. That little guy is adorable ! Good thing Favorite has a leaky tin dinghy already or I'd be jealous ! It has a 1000lb capacity and an auto-brake so that the winch won't just spin out of control if you let go of it while lowering. 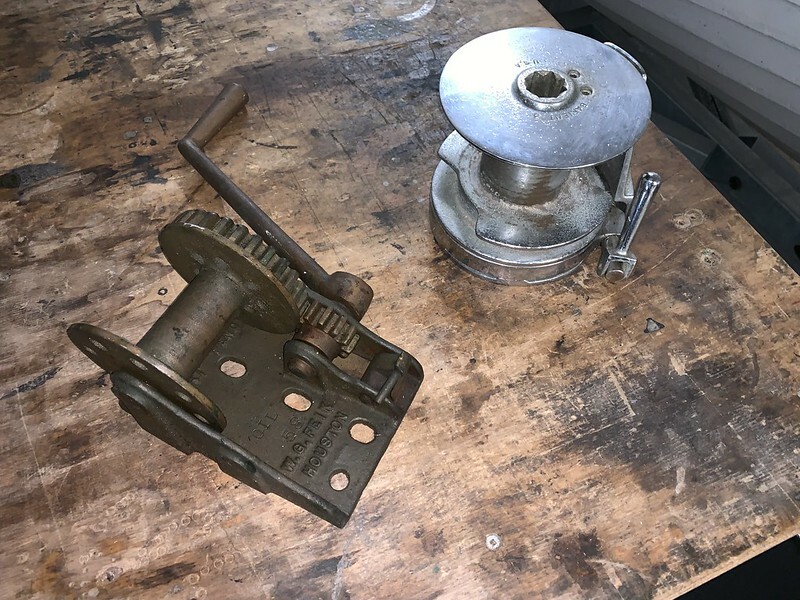 It *should* just bolt up in place of the old winch, or at most after drilling some new holes in the mounting plate on the davit, but I'll have to take a closer look at how the power winch is mounted to know for sure. This is the setup I had on Savona. Quiet, simple and effective. But I'll admit that changing from a power winch to a manual one is purely an aesthetic choice. The power winch has been likely been working fine for many years. I just dislike noise and complexity. Thus the switch from the Espar heater to the Dickinson stove, which many people would see as a step backwards. I prefer oars over an outboard too. I do, however, draw the line at the anchor windlass. I spent my childhood hauling a heavy galvanized Danforth up from the bottom by hand as we had no windlass on the boat we lived aboard. Now give me one with a great big motor and a button. Although maybe I'll get a picnic anchor that Dash can haul up a few times just so he can have the same experience I did... It'll build character! I'll admit that changing from a power winch to a manual one is purely an aesthetic choice. The power winch has been likely been working fine for many years. I just dislike noise and complexity. I think this little boat would be hard-pressed to carry two adults, a child, a medium-sized dog and a load of groceries. Add in a little bit of a chop and I think it would be a fifty-fifty thing whether we made it ashore dry foot. Or dry anything. It's true, the existing tender is fine. Pretty handy and pretty tough. No worry hauling out even up a rocky beach. Lots of built-in flotation (I have little doubt that it is unsinkable with the compartments intact, but I have not tried it). It is heavy though, and with your full bill of lading there is not going to be a whole lot of freeboard left. So be careful. But I concede your point. My point that the skiff would look good on Skookum Maru still stands, though . But replacing the electric winch with a manual one is on my list. I never had a problem with the manual winch on Savona and she had a dinghy similar to the one on Skookum Maru. Well, I never had a problem with the electric winch on Skookum Maru, so there . It is noisy, but all its bearings are permanently sealed and immune to maintenance so no way to address that. The original galvanized wire rope was in poor shape; I replaced it with amsteel, which was holding up great when I last saw it. I'd say continue to use it until you find a nice bronze manual winch that can handle the load. The stamped steel ones? Just say no . I'm with Paul on the which issue, much easier to control the lift; up or down. The dinghy davit makes a good man over board retrieval device as well. Holding a button down will be a great advantage in such a event. I have a dislike of little dinghies. In flat water with well behaved passengers they are just passable. I like a real tender capable of rowing through a chop with a load. Like taking a couple of 230 lb adults and a big dog and not worry about capsizing or taking water over the bow. Last edited by navydog; 03-30-2019 at 07:58 PM. Well, coincidentally I might know where a suitable bronze winch would be available however it does not have a brake. I doubt any vintage winch would. And I'm reluctant to haul a dinghy without a brake on the winch. At the same time I agree that the stamped steel option leaves much to be desired. I could be convinced that a motor is not a bad thing here I suppose. Agreed on all points. And it does occur to me that I may be being over sensitive to the issue of winch noise. After all it's not as if one raises and lowers the dinghy several times a day. You arrive at your destination, anchor, and lower the dinghy and there it sits, quietly (unless you are careless with your fenders and the painter, and you let it bump into the side of the boat that is) until you depart. At which point you raise the dinghy and proceed. Or just avoid that whole exercise and tow it, if conditions permit. The winch motor is not going to be an unreasonable intrusion during those operations in any case. This bronze one, normally intended for a hallyard has a brake, and could do the job. Last edited by Rapelapente; 04-01-2019 at 12:51 PM. Ah - that's lovely. Tempting but I would have to let the boat budget recover a bit from the stove project first! But it's been a very long time since I last went sailing. Looking back, I think it was actually in 1987 on a one-off stint as crew for a race out of Annapolis when I was at the University of Maryland. Chris... How about using a simple, and quiet, block & tackle? I did have that thought as well. We had transom davits with falls on St. Brendan, the boat I lived on as a kid. Worked great back then. Don't know why they wouldn't now. Except that it was only about a three-foot lift to the stern davit and we just had to lift a little 8' plywood pram that weighed maybe 60lbs. I'd guess that the lift to the boat deck on Skookum Maru is twice that or more and the dinghy probably weighs more like 120lbs. So we would like to rig it with a three- or four-fold purchase and now you are hauling on 20'-30' of line to get the boat out of the water. But combine the block and tackle with a little halyard winch like the one that Gerard posted and it could work nicely. Something to think about while the winch motor is grinding away in any case. The grass is always greener, huh Chris? I've a friend that lives in Blaine, who was recently gifted a lovely little 18' keelboat. He has no idea what to do with it, so I've been tasked with teaching him how to sail. In his words, "Come use it whenever you want." Its getting launched for the season sometime in the next couple of months. Have to love that boat! The truth is almost all sailboats are motorsailers now days whether anyone what's to admit it or not. When your 30 miles from home port, there is no wind or it's blowing the wrong way and you have to be in work tomorrow, you motor. I've been out with sailing zealots that will try sailing in air so light your breath has more power. It's not really fun of course normally I can't wait to turn the diesel off and pull up the main. Last edited by navydog; 04-01-2019 at 06:10 PM. You mean that Hand motorsailer? Ah, no. Skookum Maru is the boat for us. The William Hand (the name of that boat as well as the designer) is a stunner but she's for the seriously deep of pocket, not for working stiffs like us. Now that's an offer I will take you up on. I'd love to go sailing and I could use a refresh on basic principles myself. You pull the big rope to make it go faster, right? Yikes! What beauty! I did some repair on a Hand Motorsailer back in the early eighties when I worked at Riverbend Marine in Fort Lauderdale. I've forgotten the name of the boat but I do remember seeing her for sale occasionally since then. Hand knew what he was doing when he did his line of motorsailers. They are gorgeous boats, strongly built and pretty good sailers, too. Well if this week had gone according to plan we would have woken up at anchor in Reid Harbor, Stuart Island this morning. Right about now we would be getting ready to weigh anchor and head back across the Strait of Georgia for Blaine and home. But as it often does life conspired to keep us in Seattle this week. And a good thing too as it turns out. The marine forecast for the area is predicting 25 kts and 2'-4' wind waves today. Skookum Maru would probably handle that just fine but her crew would well bounced around for a couple hours at least. I'm sure we will encounter plenty of weather in the next few years but I'm just as happy to pick calm conditions when we can. There will be plenty of other chances to go cruising this spring and summer. In the meantime however I received gifts! Any and all thoughts welcome here. What you need is a check valve for 3/8" line ... running it through a cam cleat would probaly wear it out fast, hunh ? Or a switchable up-down ratchet on the handle. Cut the handle off a 3/4" Harbor Freight ratchet and insert that between the handle and the sprocket. That would make it stick out farther tho. 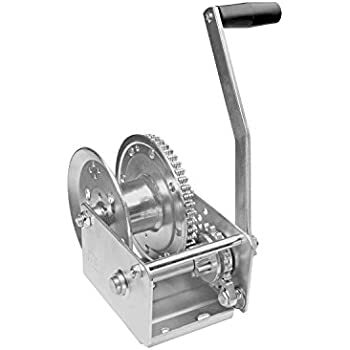 If you went crazy you could design a ratchet that went into the handle itself. A self tailing winch would easily work. Lowering would use friction around the drum. Last edited by navydog; 04-13-2019 at 04:19 PM.